The Scullen 8AA team fell short in their home opener against Granger last night. Despite the loss, the girls continued to work together, showing great teamwork and perseverance. They continue to improve each day and are looking forward to rebounded next Wednesday. Thank you to everyone that came out to support! On Thursday night the the 8th grade A team played Granger at home. The girls played hard, but came up short in the first two matches. In the first match the girls lost by two with a score of 26-24 and in the second match they kept it just as close with a final score of 25-22. Catherine R. and Sindu T. served the ball well and Sam L. did a nice job setting at the net. Nice work, ladies. Both 8th grade teams play away next Wednesday at Jefferson Middle School. The 7AA and A girl’s volleyball team took on Granger last night and won both matches. The girls had amazing serves and showed tremendous teamwork and enthusiasm. The sharks will play their next game on Wednesday at home. 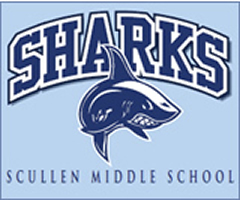 Come on out to support your Scullen Sharks!